... is the drummer and percussionist of orfeas. George Lernis was born and raised in Nicosia, Cyprus. At the age of 13 he started attending private drum lessons. In addition, from a very young age George became interested in hand percussion. He currently plays a number of percussion instruments, such as: Tablas, Hadjira, Kanjira, Bendir’s (Frame drums), Davul, Darbuka, Riq, Pandeiro, Conga, Cajon, Timpani, Glockenspiel and Marimba. By the age of 15 George was playing music with several bands in the styles of Jazz, Rock and Greek music. In 1998 George joined the Cypriot Army Force where he eventually became a member of the military band serving as the lead drummer of the Jazz and Greek band of SMEF as well as the lead marching snare drummer. In 2001 he came to the United States to study music at the prestigious Berklee College of Music in Boston. Throughout his studies George attended private lessons with musicians like John Hazilla, John Ramsay, Kenwood Dennard, Dave DiCenso, Mark Walker, Dave Samuels, Gary Barton and Gary Chaffee. 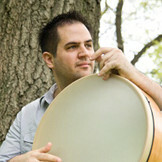 He graduated on April 2005 earning a Bachelor degree in Jazz Performance. In 2008 George was accepted at the Longy School of Music from where he received a master’s degree in Modern American Music. During his graduate studies he attended private lessons with drummer Bob Gullotti. After graduating from Longy School of Music, George attended private lessons with percussionist Jerry Leake for several years. George has performed in venues such as: Carnegie Hall (NY), Metropolitan Museum (NY), Museum of Fine Arts (Boston), Berklee Performance Center, New England Conservatory, Shalin Liu (Rockport, MA), Regatta Bar, Scullers Jazz Club, Ryles Jazz Club, Blackman Theater, MIT Kresge Little Theater, Zero Arrow Theater, Tsai Performance Center, (Le) Poisson Rouge (NY), Joe's pub (NY) and many more. Over the last few years George has recorded and collaborated with prominent figures such as: Mehmet Ali Salnikol, Dave Liebman, Anat Cohen, Antonio Sanchez, Tiger Okoshi, Jerry Leake, Bertram Lehmann and Robert Labaree to name a few. Muscari ensemble performing Asian Minor music. Esthema, a fusion group from Boston, MA that performs World Music in a Jazz improvising setting. Mina Cho’s Jazz trio, quartet and quintet. Somerville Community Baptist Church as the lead drummer during Gospel services. George performs regularly around the New England area, New York as well as tours around the United States and Europe.